…means challenging, loving, and supporting, students as they seek to find meaning in their educational experience. We work hard to encourage our students to model more, each day, the life of Christ. We promote, in our students, a sense of self-understanding, and whole child health. We also help our students develop God-honoring relationships. Overall, we seek to work together in inspire and equip students to engage the world with Christ’s transforming power and love. The goal of Student Life is to shape Christ-centered student environment and culture at DC. Whether your child is a leader in the classroom or in the community, Denver Christian students believe they have the power to make a difference. Students are encouraged to participate in a variety of co-curricular activities in addition to their academic endeavors. So, whether it is a passion for fine arts or athletics, service work or spiritual development, our students’ interests can easily be met-all while earning an exceptional education. We have a vibrant student culture that extends from Preschool to High School. There is a passion for excellence in all things. This excellence extends from the classroom to the hallways, in friendships, and in artistic and athletic endeavors. For God is excellent and so we strive to be more Christ-like in all we do. What is most evident in the halls of Denver Christian School is the respect and love that is felt by all who walk in them. From the students to the faculty and staff, to the alumni and parents to our guests, our inclusive culture makes all feel welcome. Equally important to our overall culture is giving our high school students the separation and distinction adolescents crave as high schoolers. This includes traditions unique to our high school including a thematic week of events for Homecoming week, Senior traditions including stays at a dude ranch, high school visits to the Denver Center for the Performing Arts, and so much more. Our High School culture is one that sees students in different grades sharing the classroom and the playing field and developing friendships based on commonalities versus class distinction. Through Denver Christian’s one campus model, our older students can serve as mentors for younger students. Faith Families are a great example of the blessings of a K-12 environment. Once each month, our faith families, which consist of at least one student from each grade level, come together for a time of service to others. The projects and activities are led by the senior class member of the faith family, but the mentorship opportunities are found at each grade level (except perhaps for the preschool – who are happy to be mentees!!) 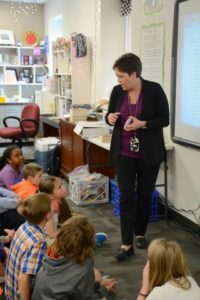 Elementary classes often pair up and have “book buddies”, and high school students have opportunities to forgo study hall to serve as “teacher assistants” for lower grade teachers. At all ages, our students benefit from the experience that a Preschool – 12th grade environment provides. Our focus in student conduct and discipline is on restorative practices which emphasize the importance of relationships within the school; student to student and teacher to student. It’s about building those relationships in the DC community. When students and teachers feel a sense of connection to each other and to the school they are both inspired to succeed in their given areas of focus. Students and parents must read and agree to the code of conduct and governing principles stated in the Student/Family Handbook of Denver Christian School upon enrollment. These includes behavior, dress code, technology usage, and anti-bullying policy, and more. Denver Christian’s co-curricular programs provide a wide range of activities that nurture whole child development. Competitive Athletics Teams for 6th–12th grade students in a variety of fall, winter and spring sports. Fine and Performing Arts programs are available during the school day for all students with deeper experiences offered after school for middle school and high school students. School Clubs and Activities including Girls on the Run in elementary, Inventors Club in Middle School, Speech and Debate in High school, and so much more. Trips including college exploration trips, DC Band to Disney World, domestic and international mission and service trips. DC Summer Camps are open to all students in the Denver community. Full day and half day options are available including speciality camps. What do you like about DC?